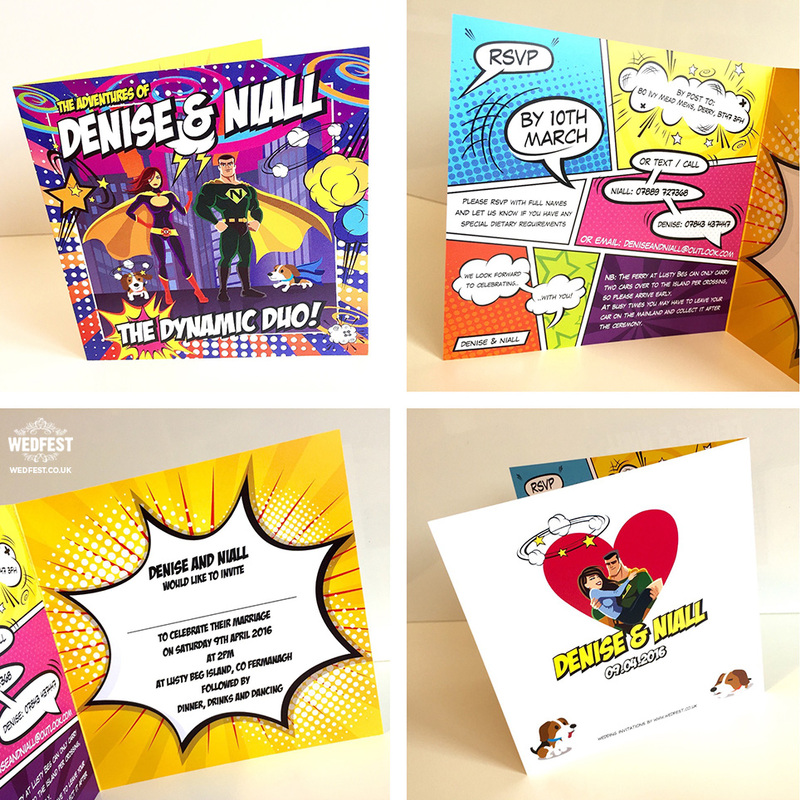 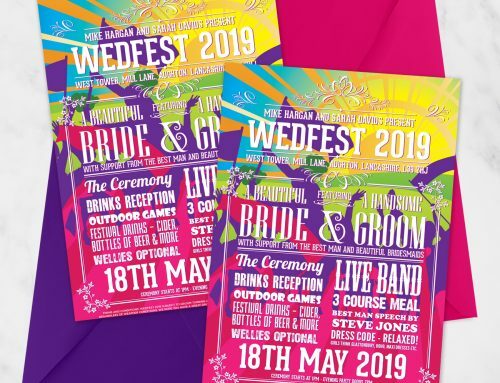 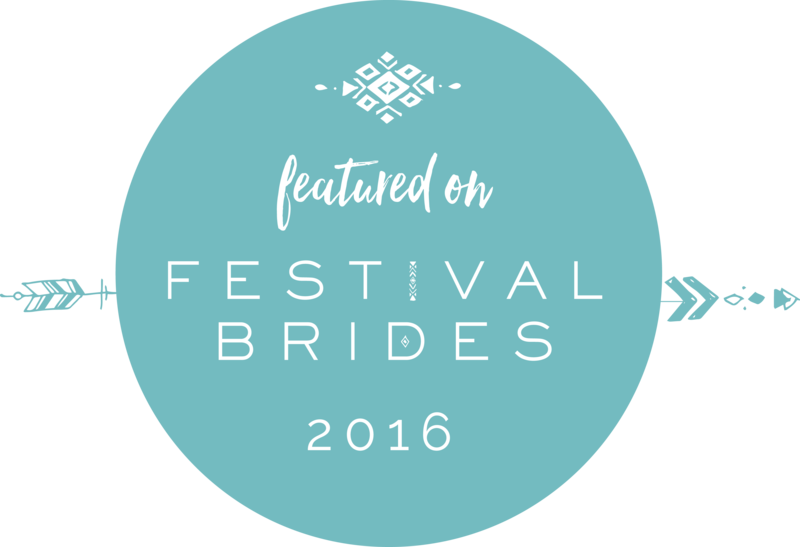 If you are familiar with our website you will know that Wedfest specialise in a huge range of awesome, amazing and quite frankly super cool alternative wedding invitations and wedding stationery. 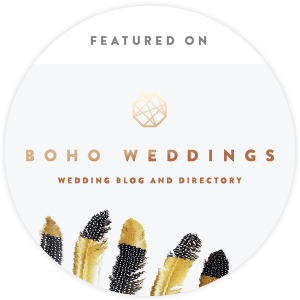 This website is full of amazing wedding invitation designs and inspiration and we are constantly adding new and exciting designs. 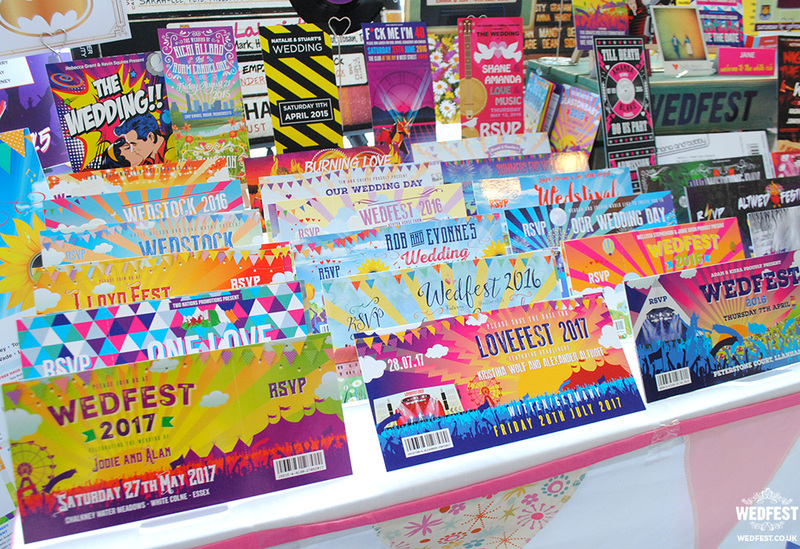 As we have got busier it has got harder to add new posts and products as often, so today we want to show you a range of alternative wedding stationery from some photos we took at a recent Quirky Wedding fair where we were able to photograph and showcase a lot of our amazing wedding stationery together. 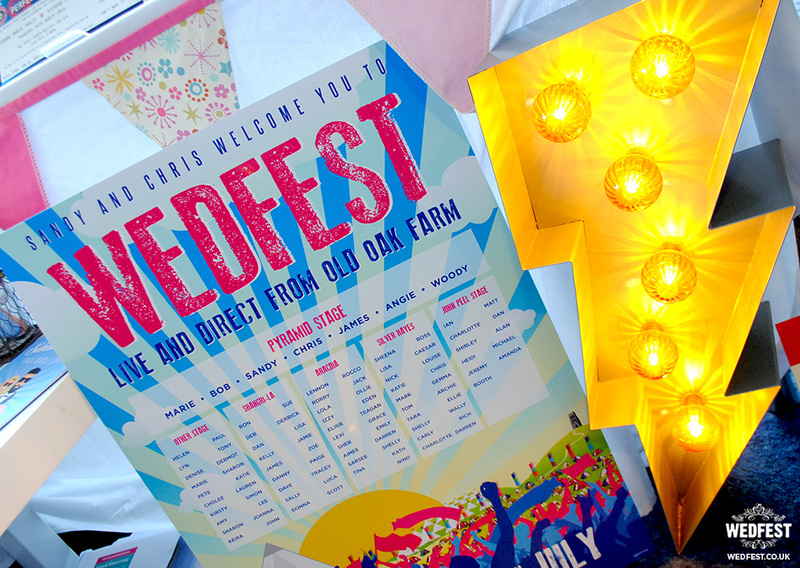 So in no particular order here is a showcase of some of our favourite photos…. 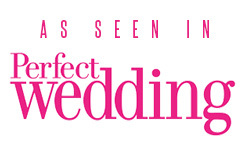 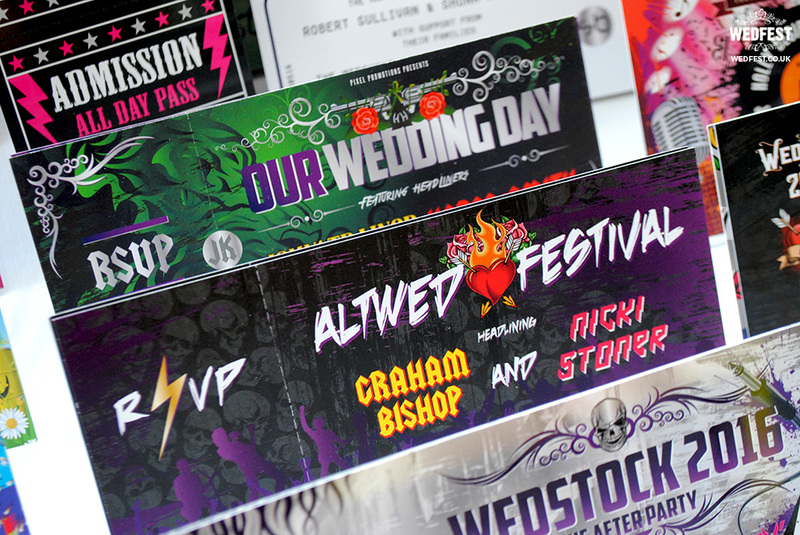 Of course one of the main products we make is wedding invitations. 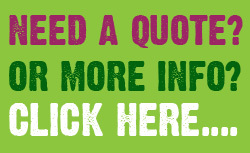 We offer all sorts of styles and themes. 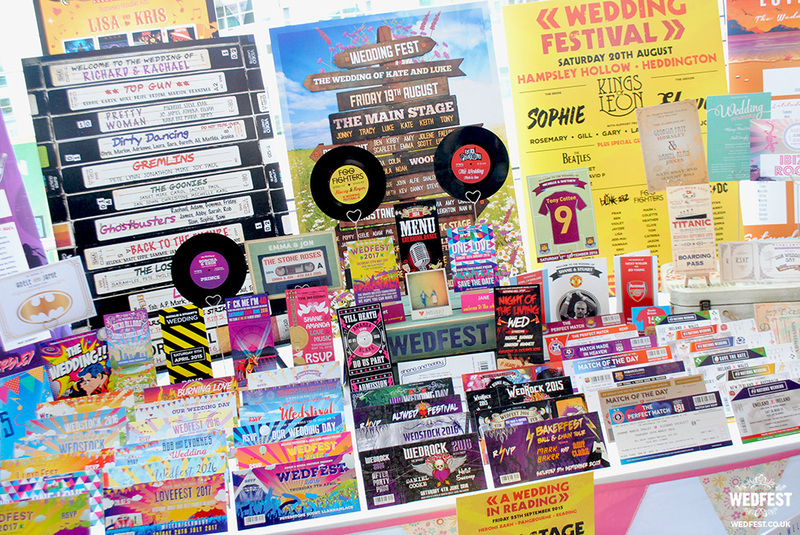 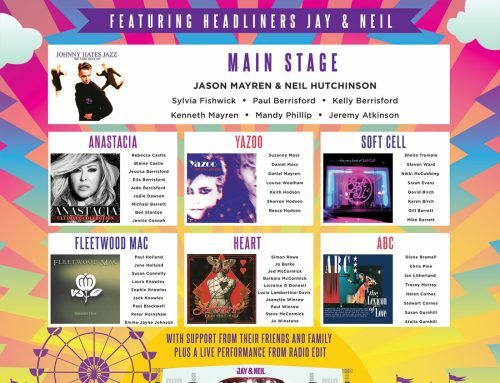 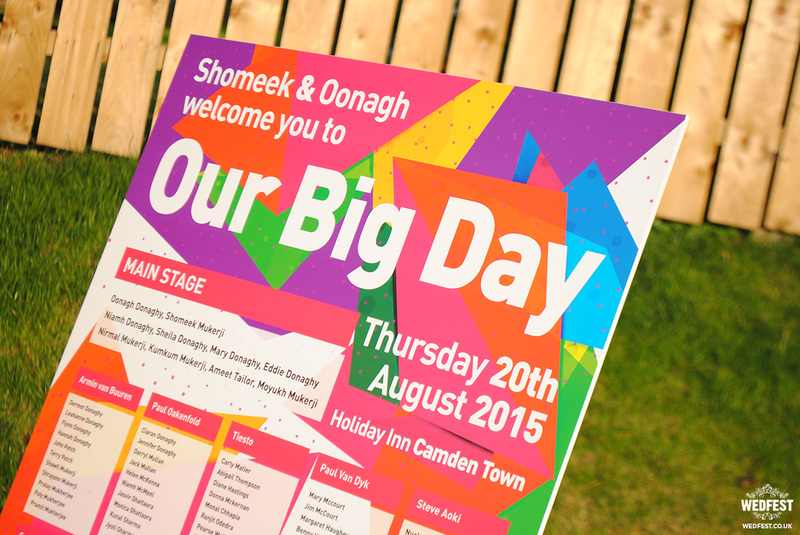 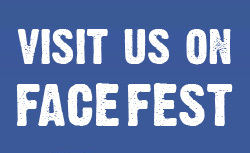 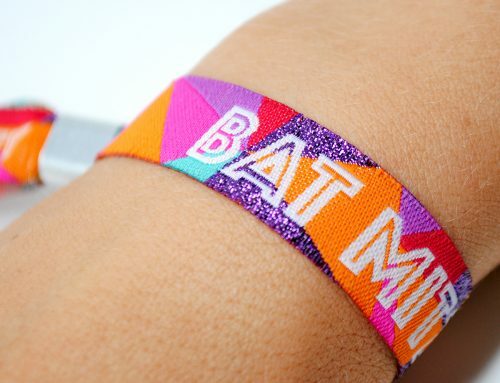 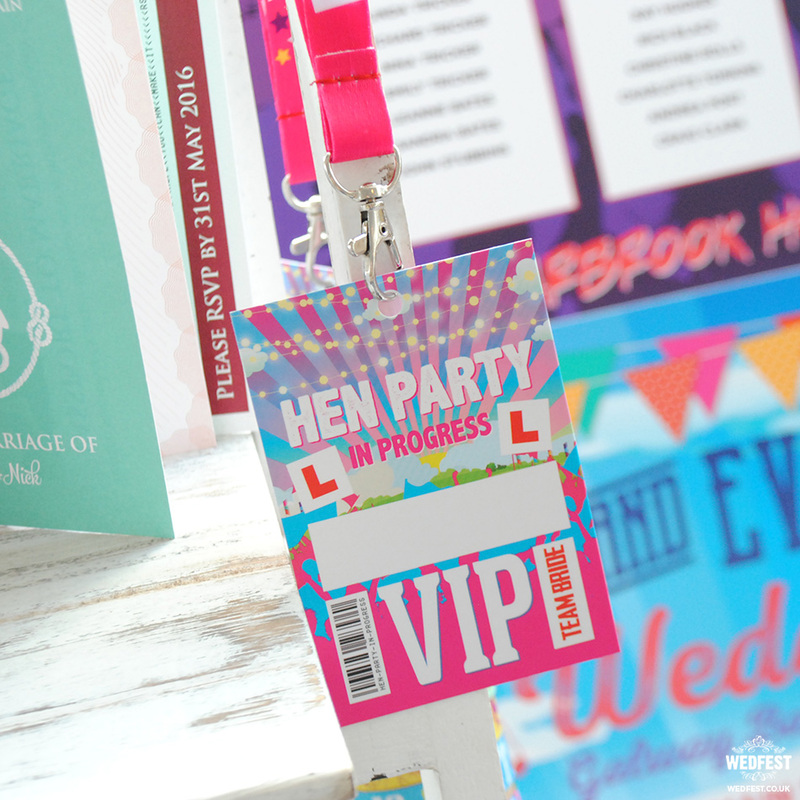 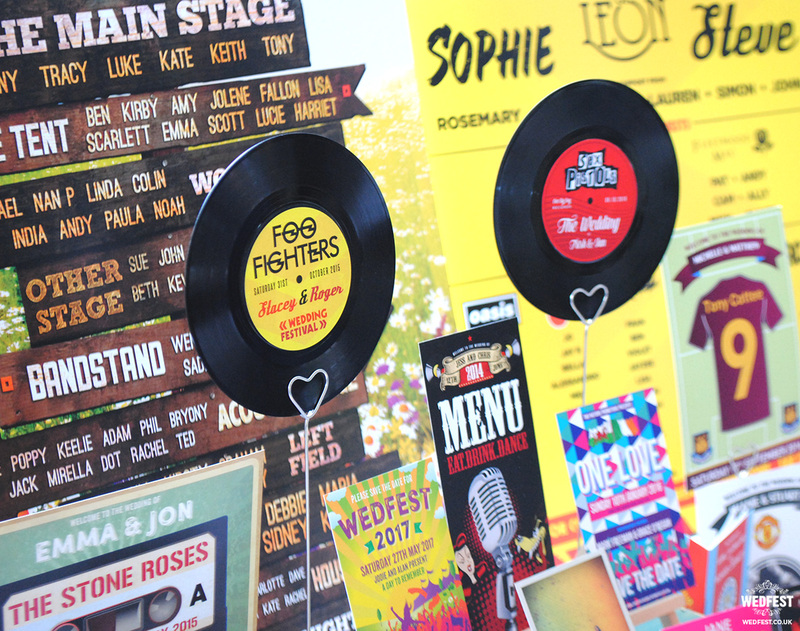 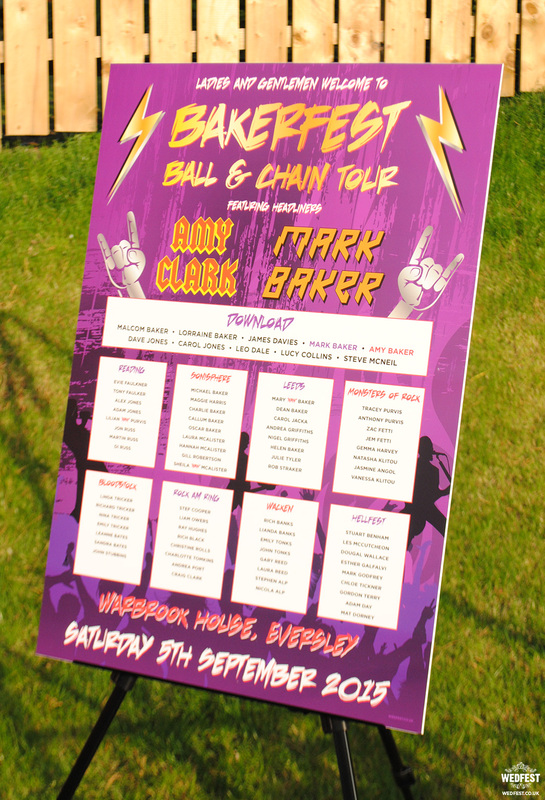 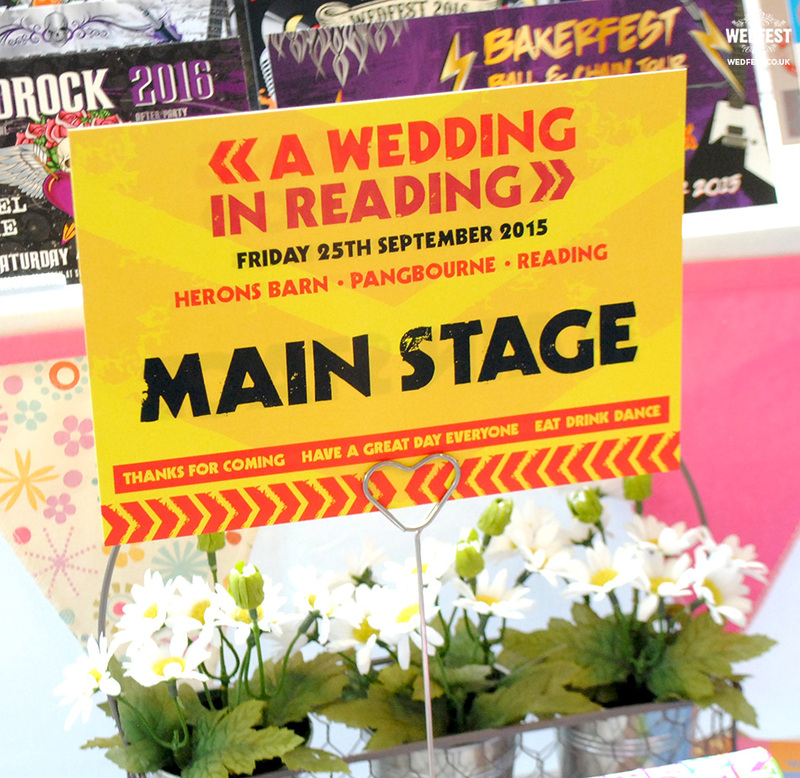 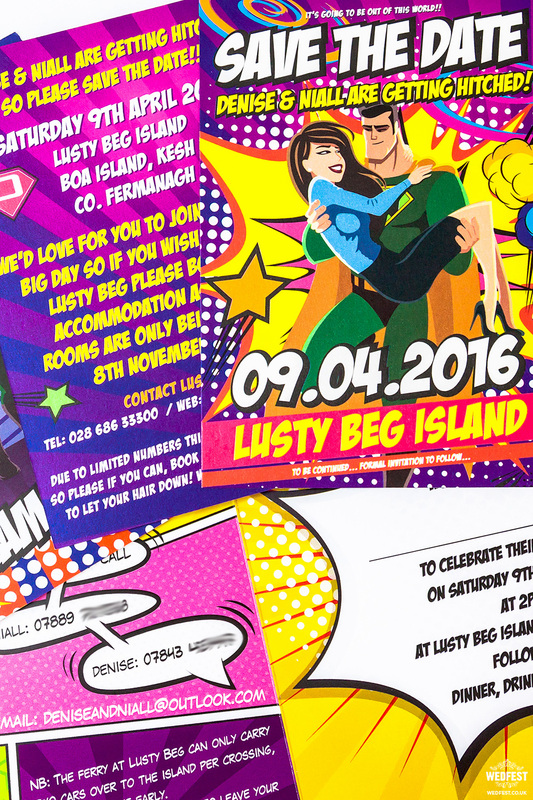 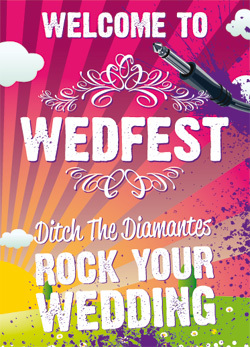 Easily our most popular range of wedding invites is our amazing festival themed wedding invites. 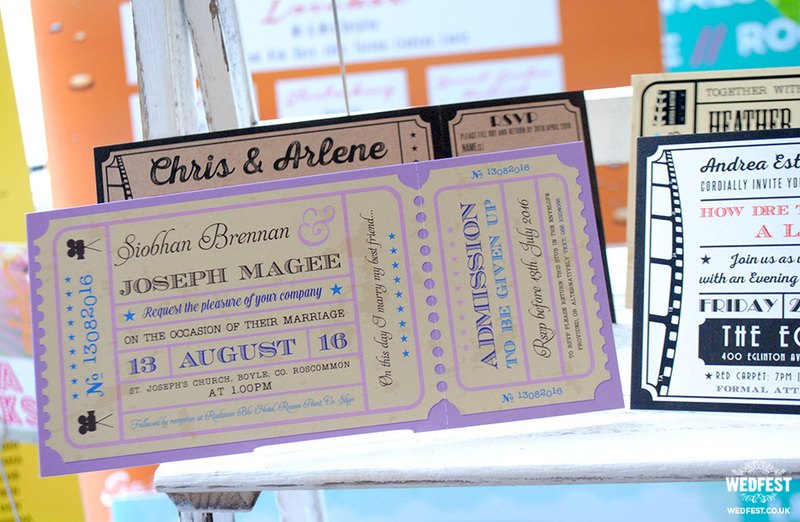 As you can see in the photos we have many, many variations of styles and themes for these invites. 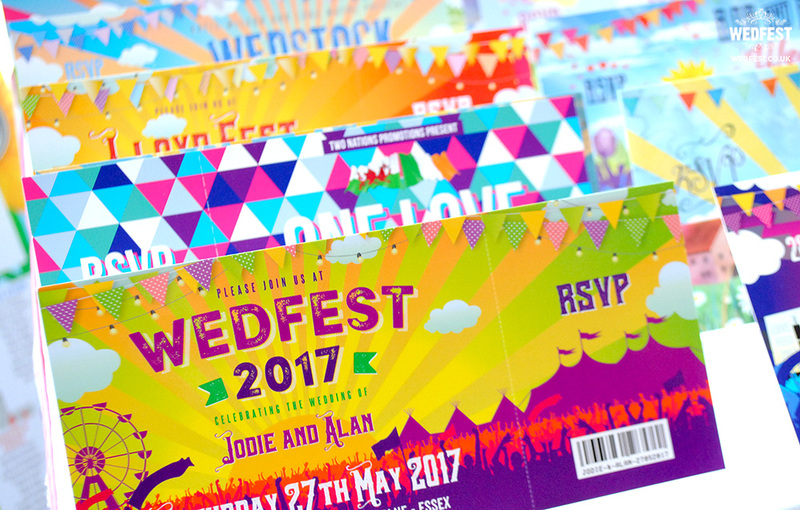 One our favourite recent designs is this Wedfest 2017 design below in a beautiful yellow, green and purple colour scheme. 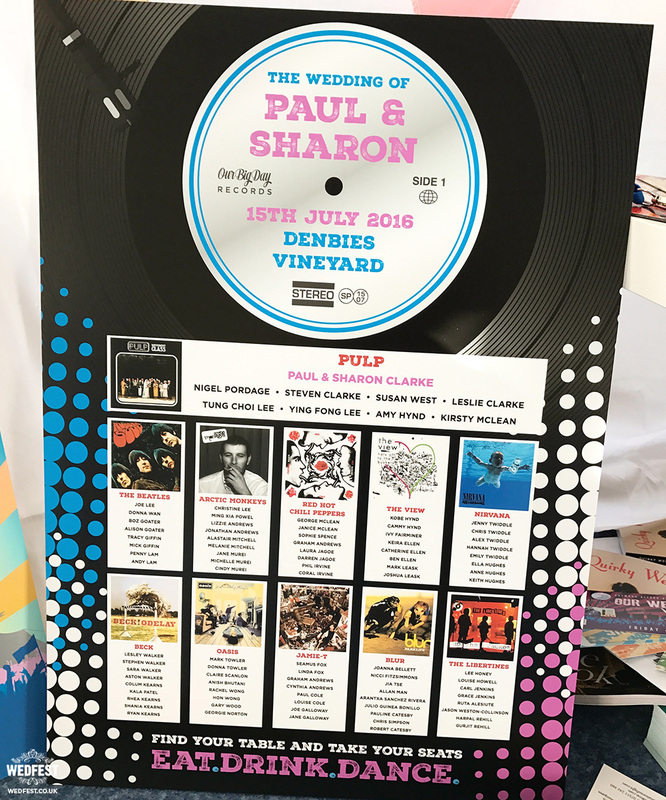 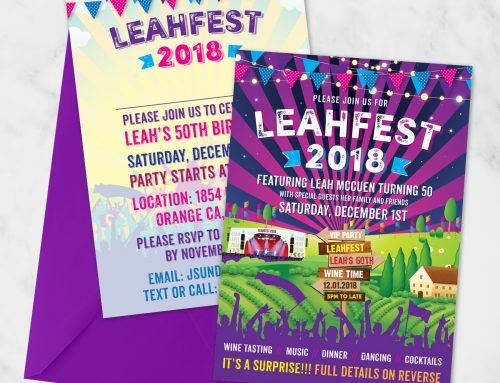 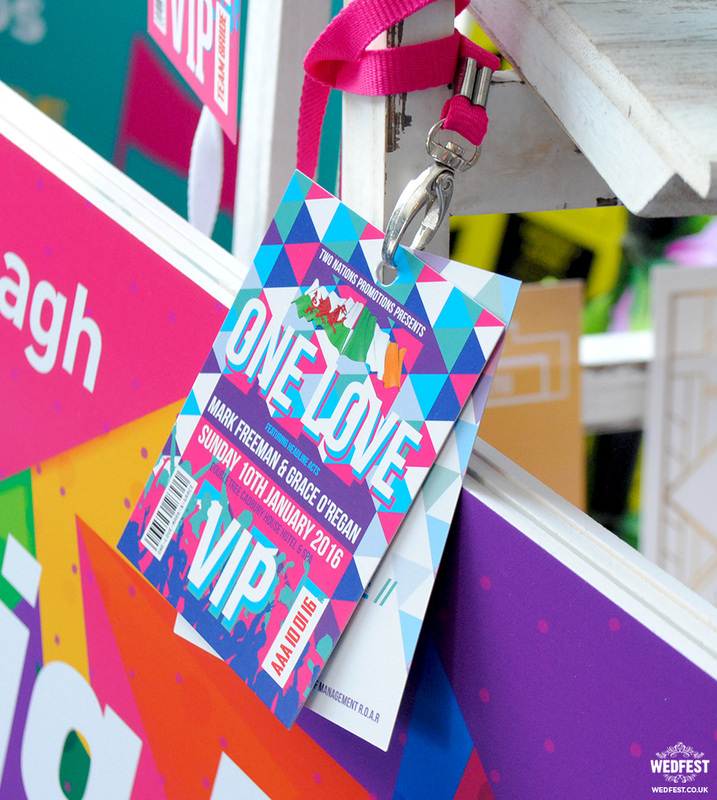 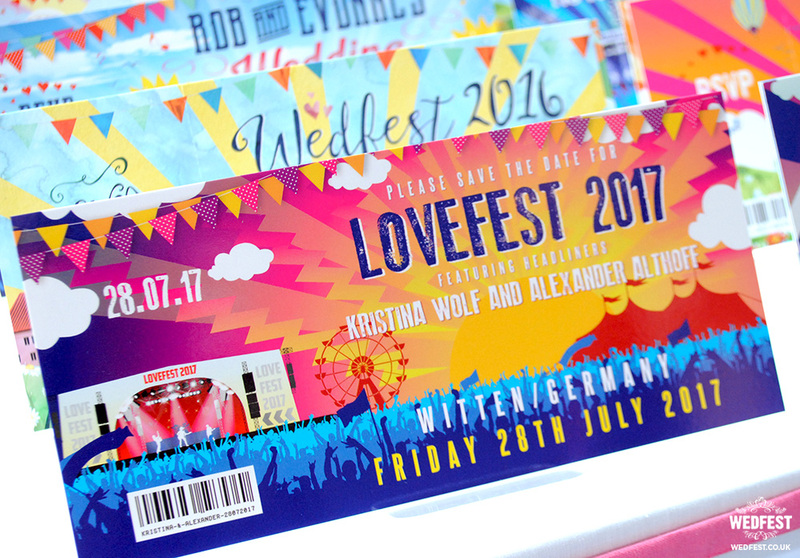 This Lovefest festival wedding invitation is also a great design full of colour and really gives off the idea of an amazing live music festival. 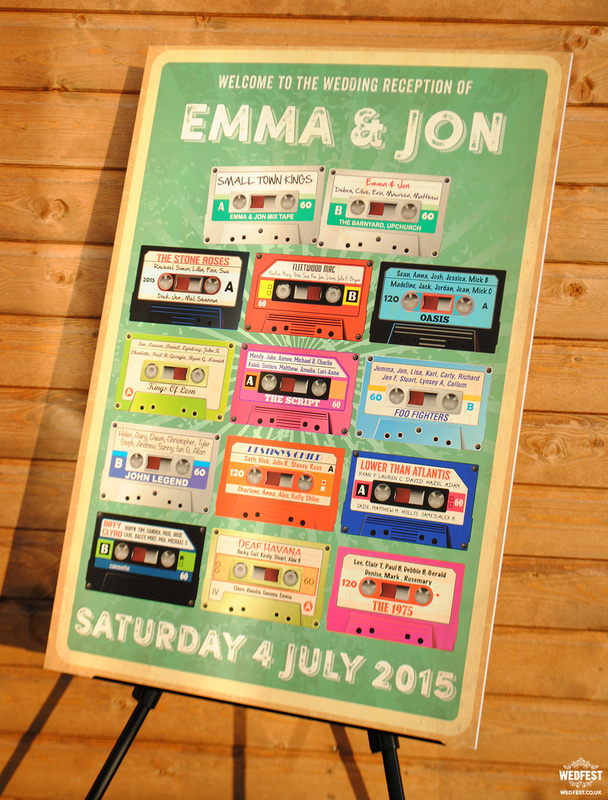 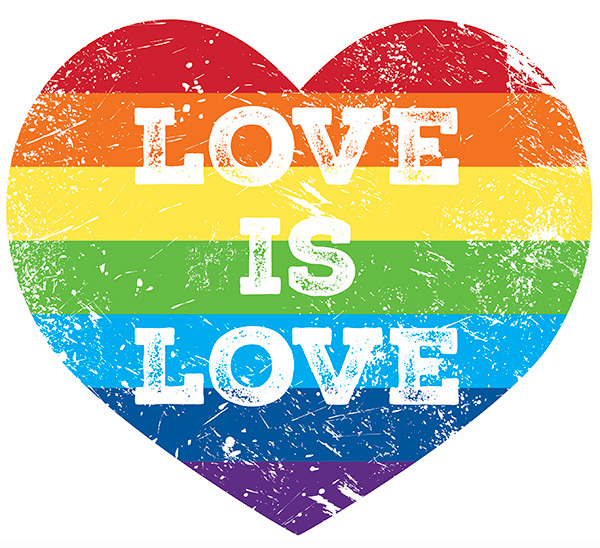 This particular one below was actually used for a wedding save the date card, but like all our designs they can be used and adapted for any piece of your wedding stationery. 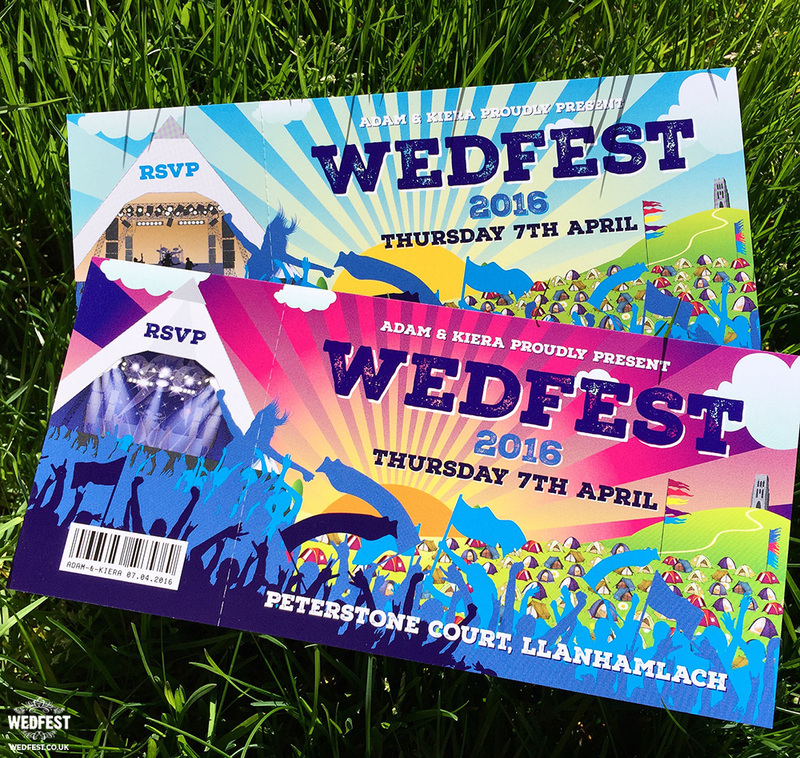 This Wedfest festival wedding invitation design has long been one of our most popular and its easy to see why. 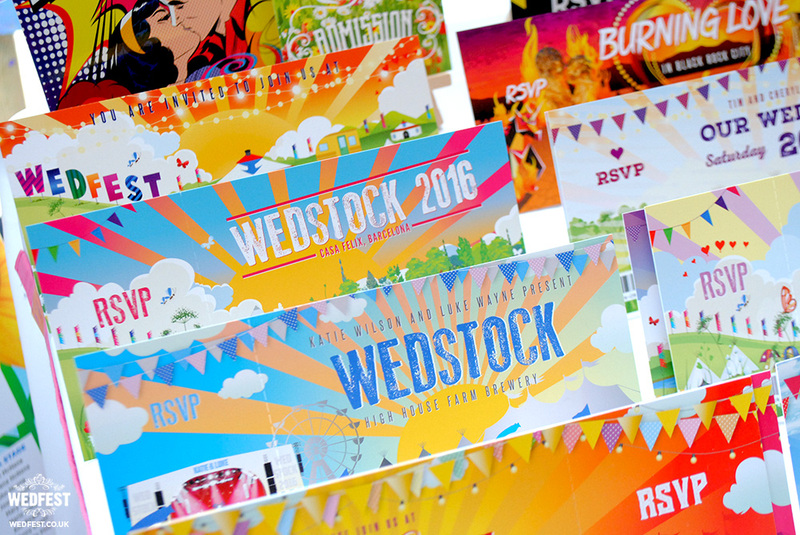 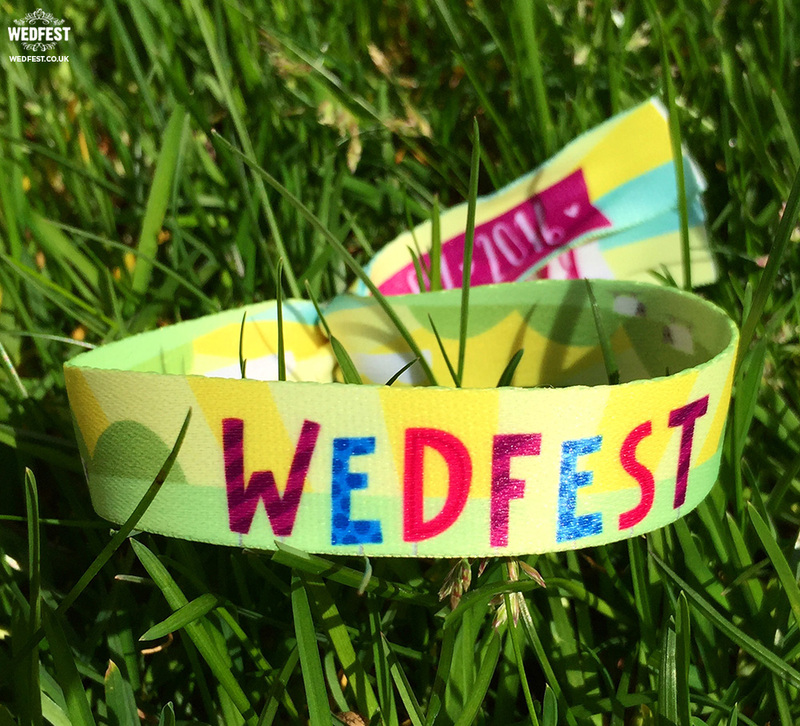 Another popular term for festival weddings is WEDSTOCK and we have many designs to suit that range. 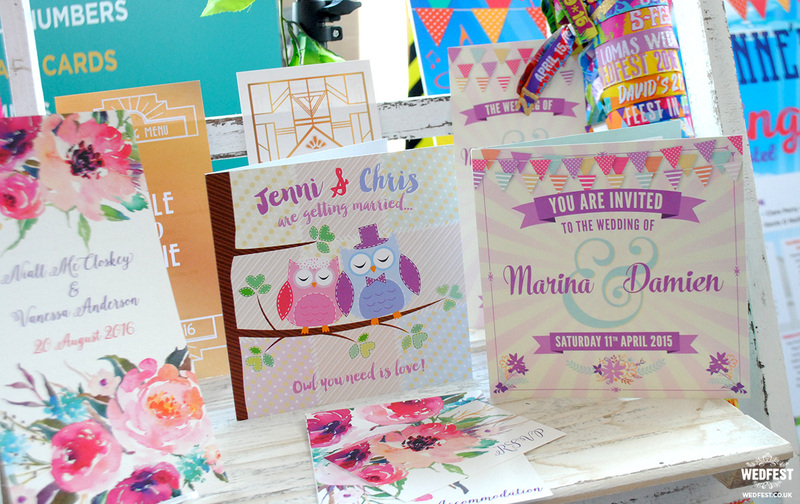 All of these designs and themes can be mixed and matched to create the wedding invitation style that you would like. 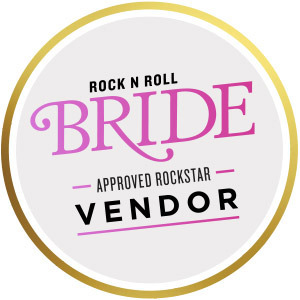 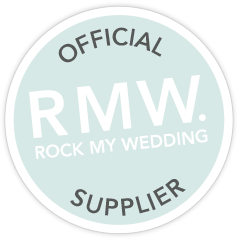 If you are a rock n roll bride and a more rock and roll theme or hard rock style is your thing then we have got you covered for that also. 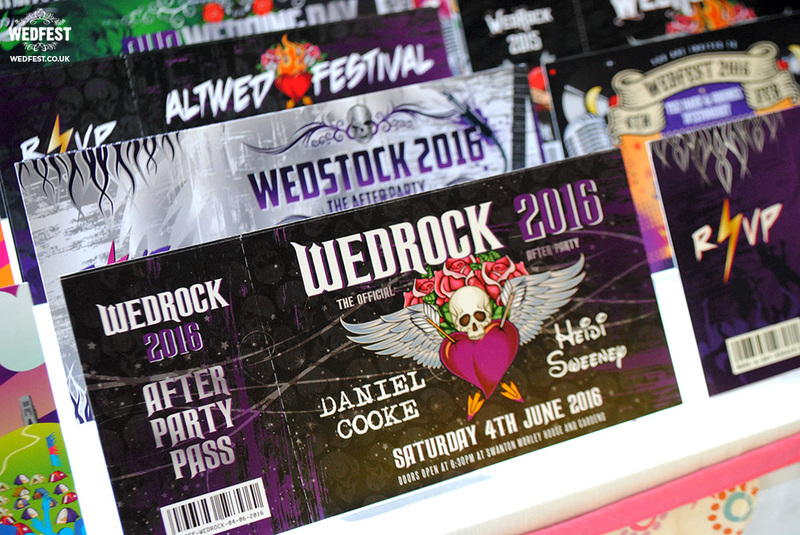 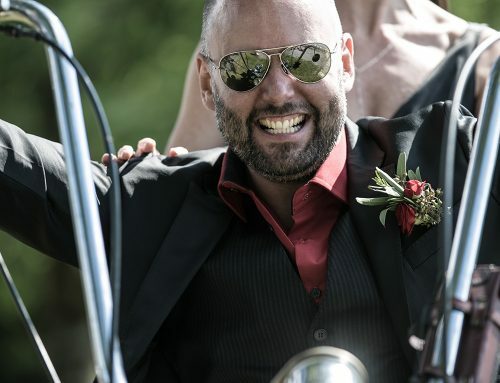 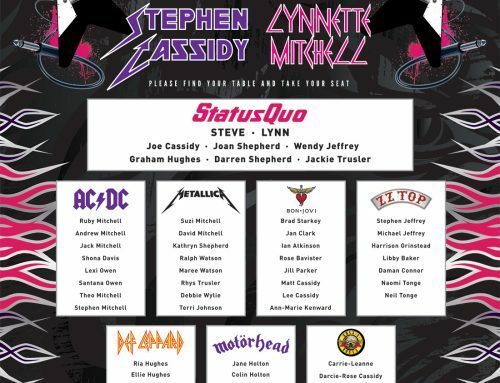 Lots of our customers love to use dark colours such as black, purple, red, and silvers to bring that rock edge to their wedding invites, and the use of imagery like guitars, skulls, hearts, tattoo’s etc. 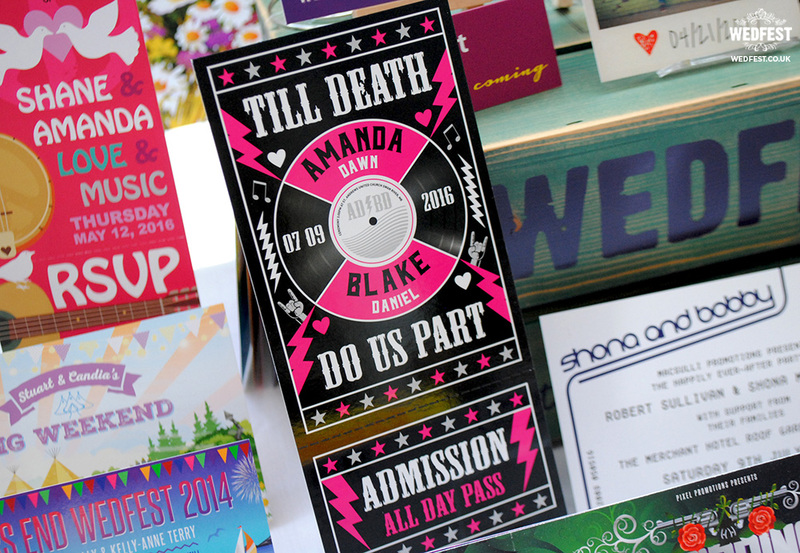 This Till Death Do Us Part wedding invitation is one of our current favourites, it is extremely cool. 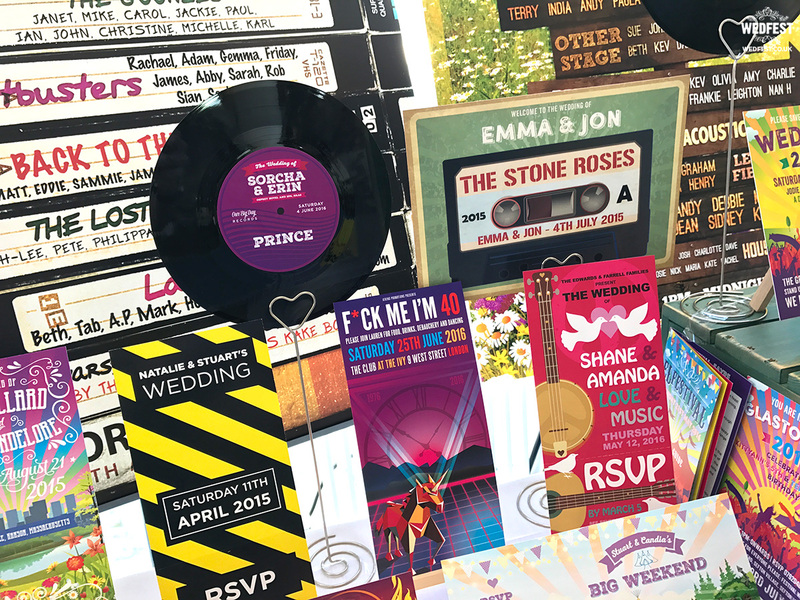 Also check out the contrast between this invite and the woodstock themed wedding invitation to the left and the gig ticket wedding invitation design to the right, we can cover all styles no problem. 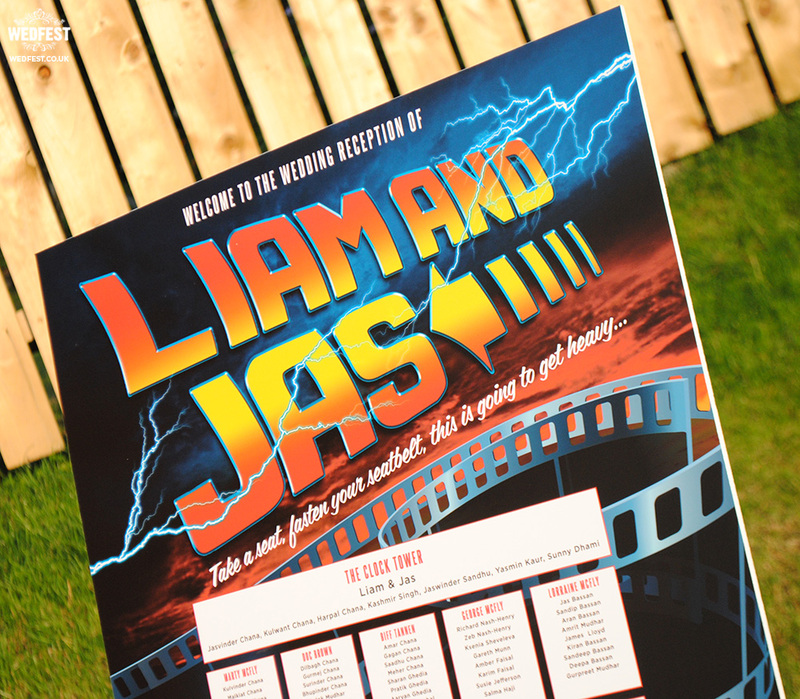 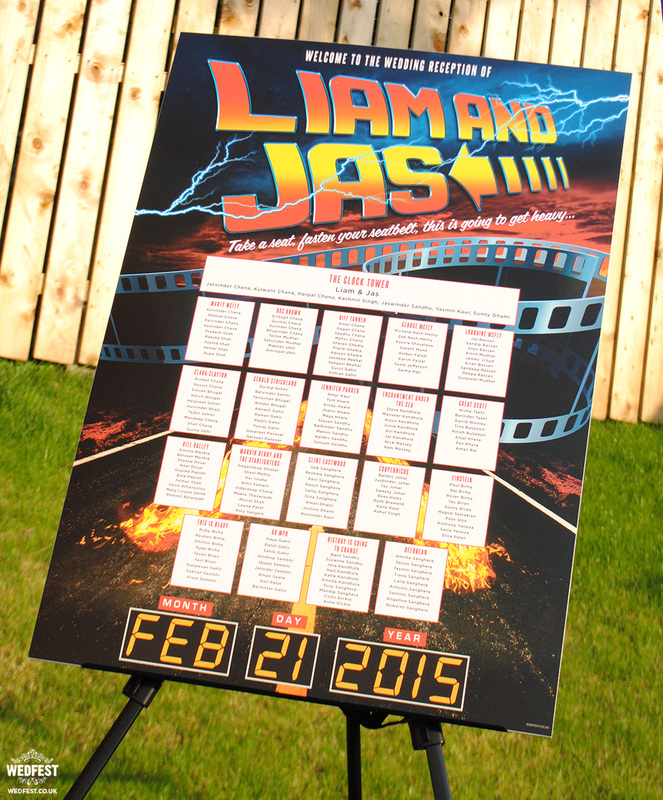 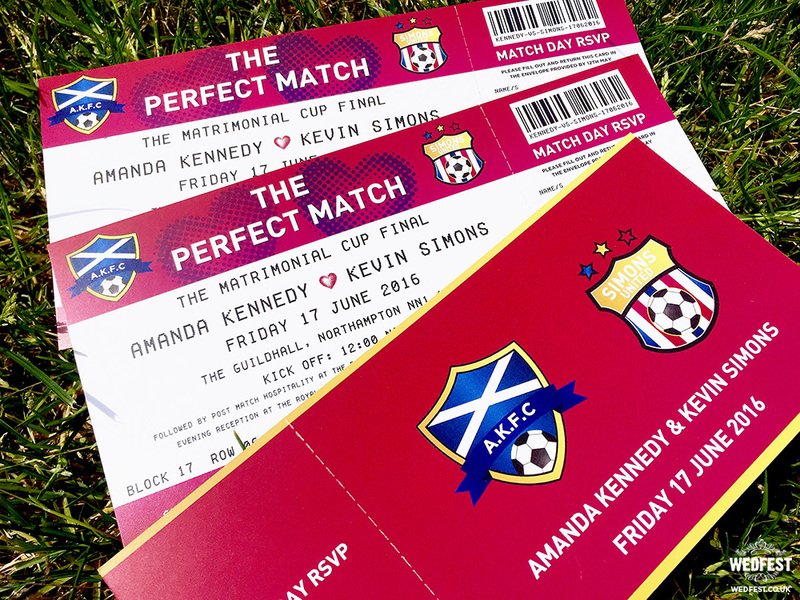 If festival or music style invites is not your thing we can do all sorts of themes such as for cinema and movie lovers we make a great range of movie ticket style wedding invitations. 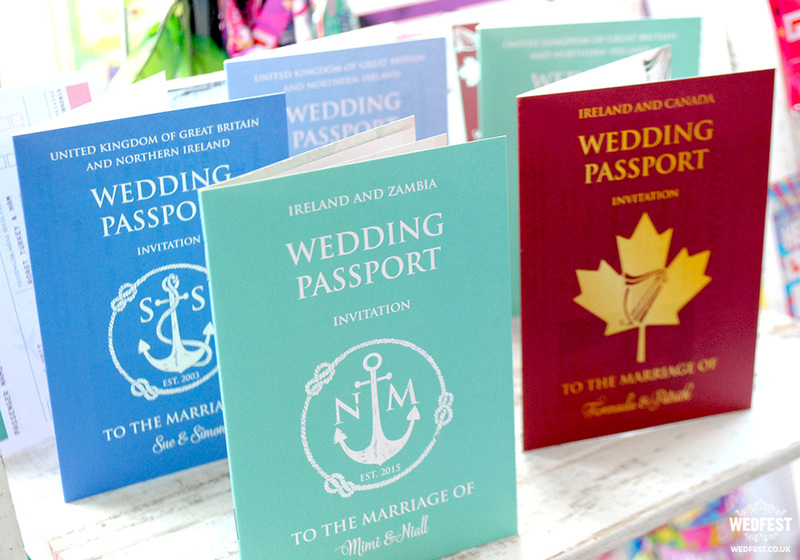 We can make these passport invitations in any colour and fully customise to your needs. 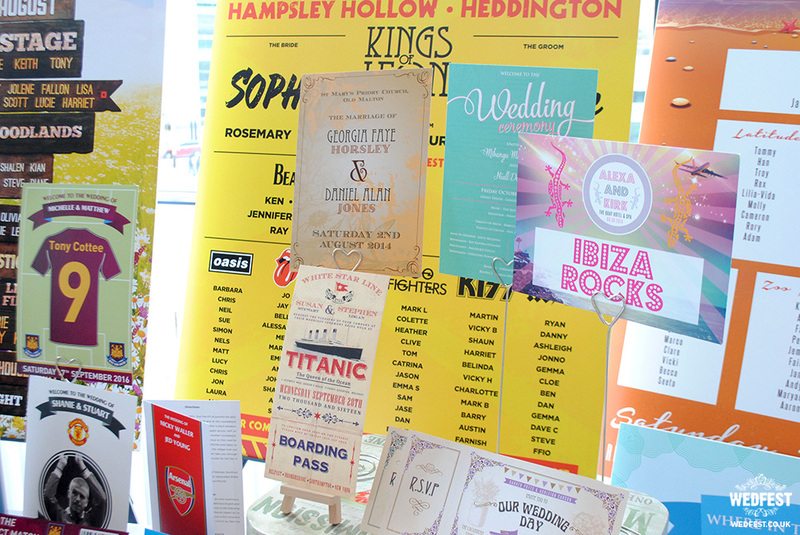 Maybe you want to focus your wedding stationery on the actual destination you are getting married? 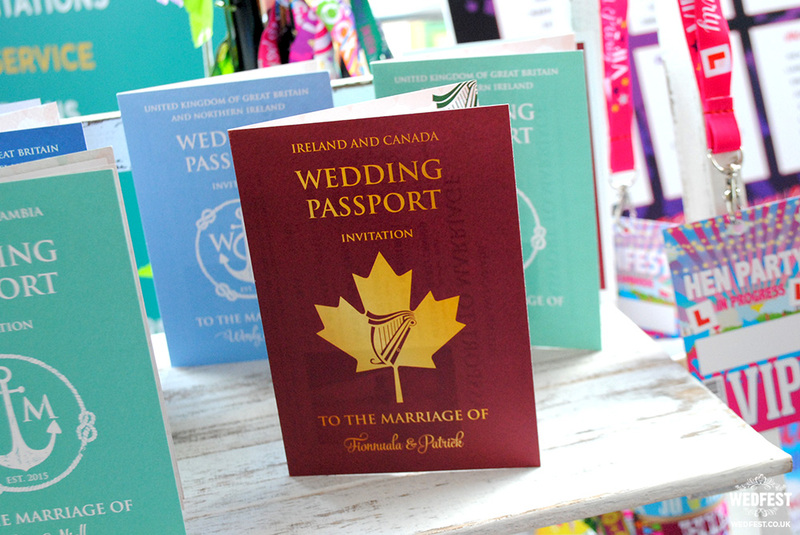 If so we can do that also, we have created wedding stationery for destinnation weddings all over the world. 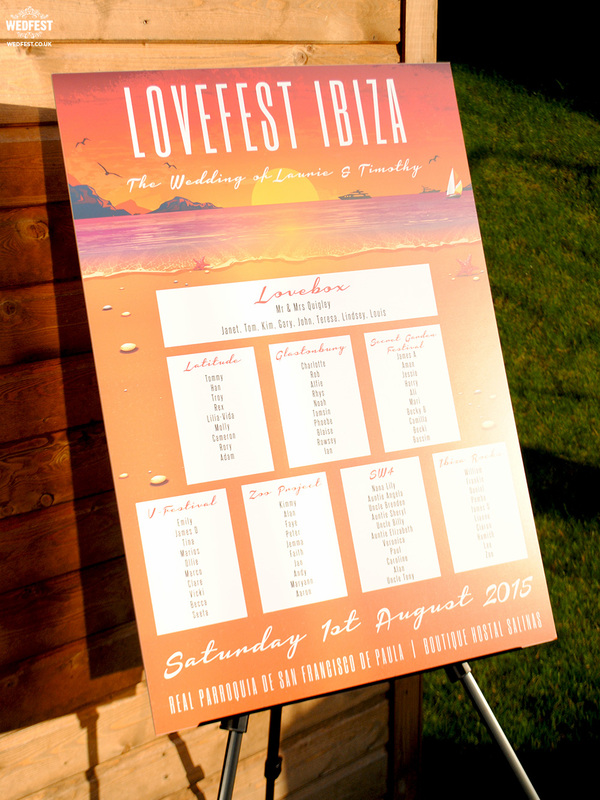 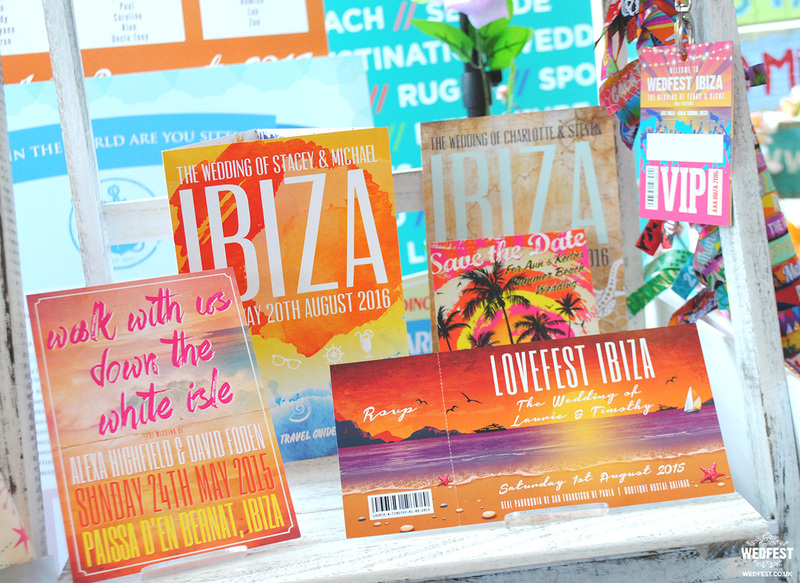 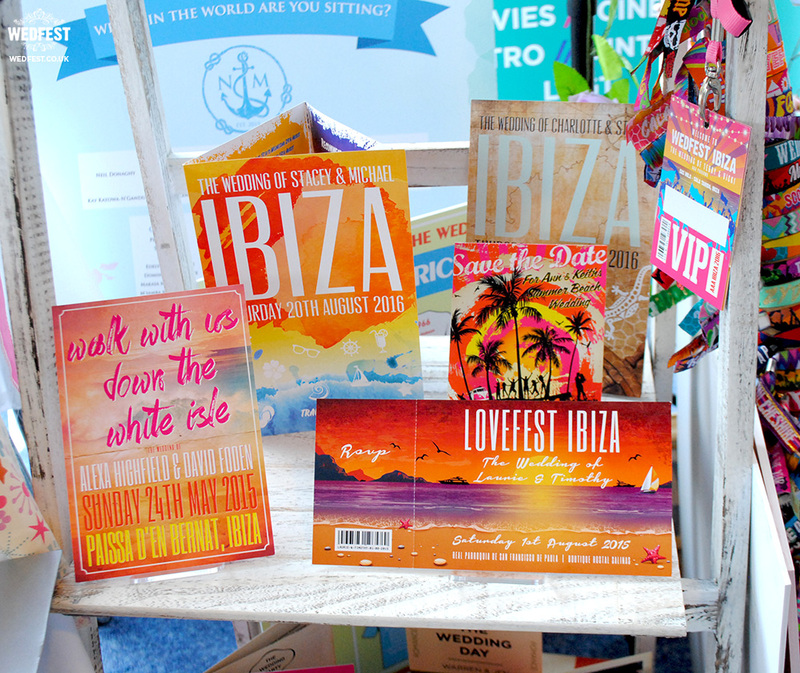 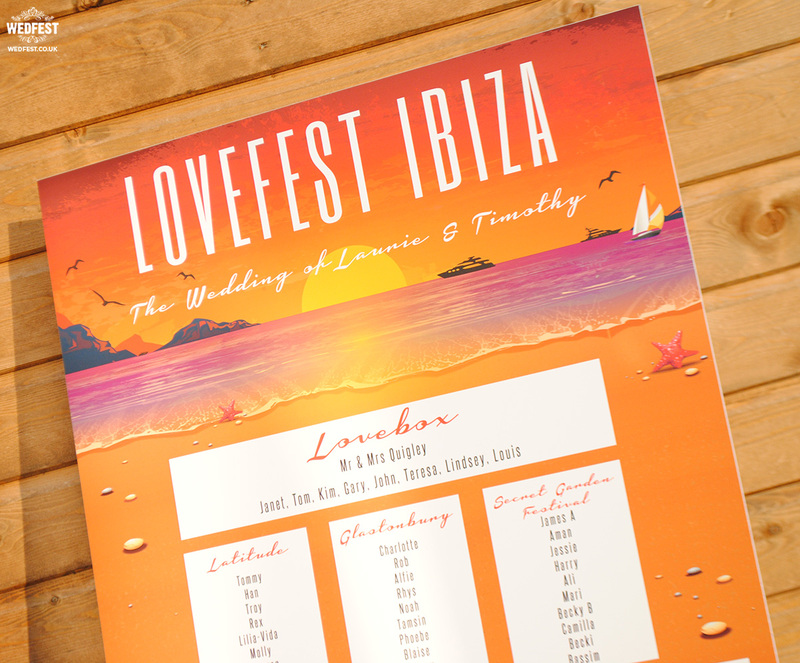 Check out these super cool Ibiza wedding invitations we have made for couples getting married on the white isle. 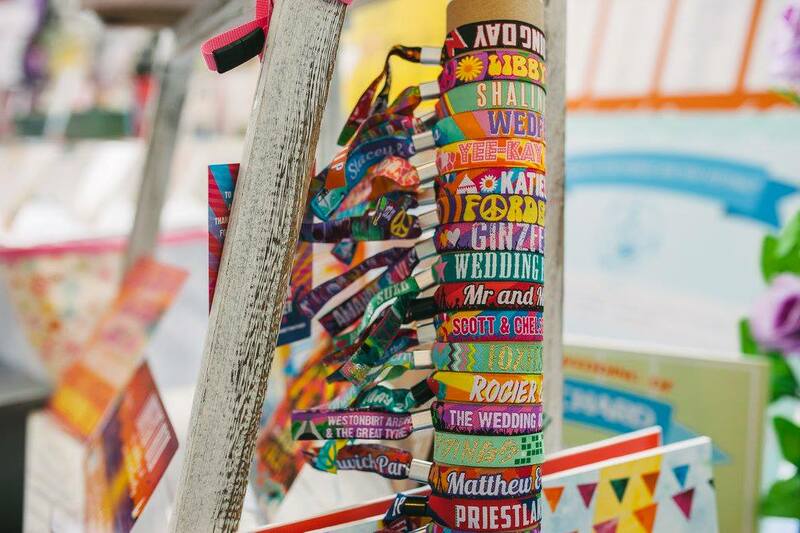 Are you and your other half book geeks? 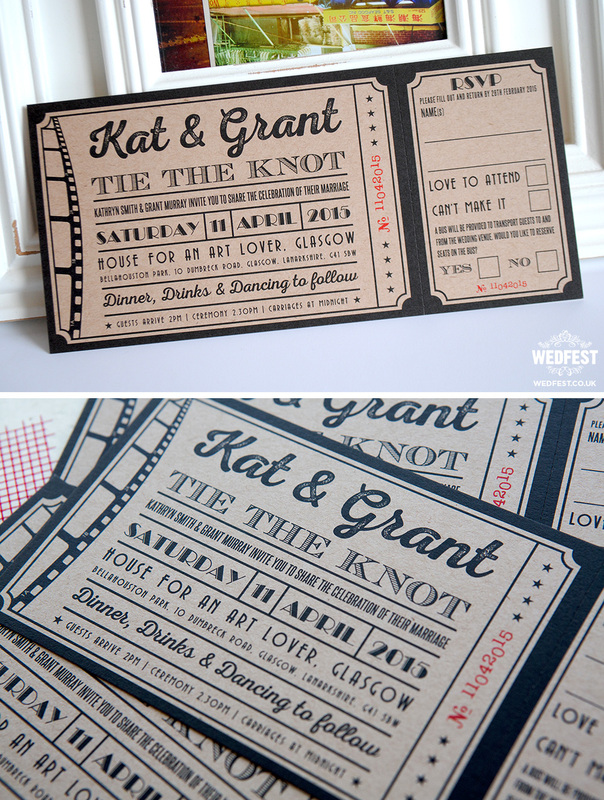 Then maybe a book or literature themed wedding invitation is what you need. 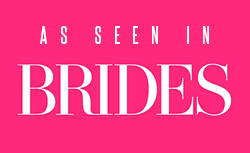 It’s hard to beat a classic movie right, and they don’t come much bigger than Titanic. 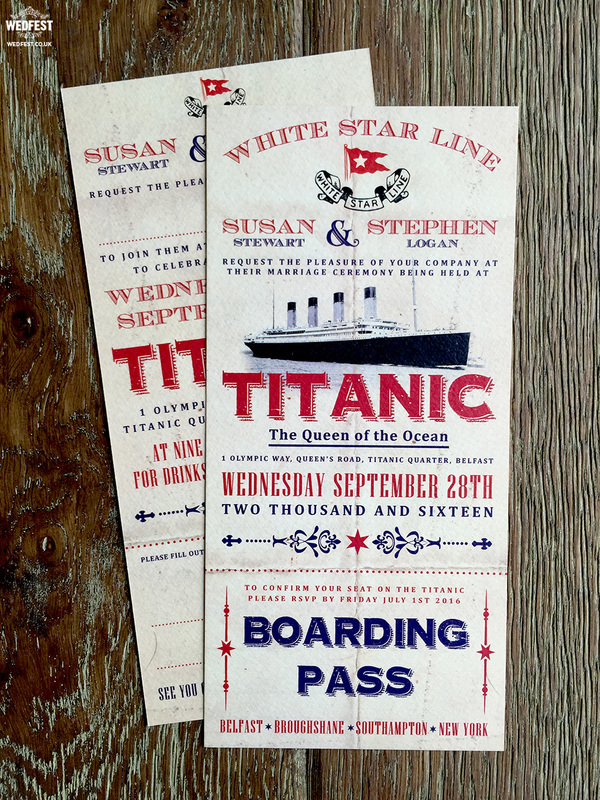 Check out these Titanic boarding pass wedding invitation tickets. 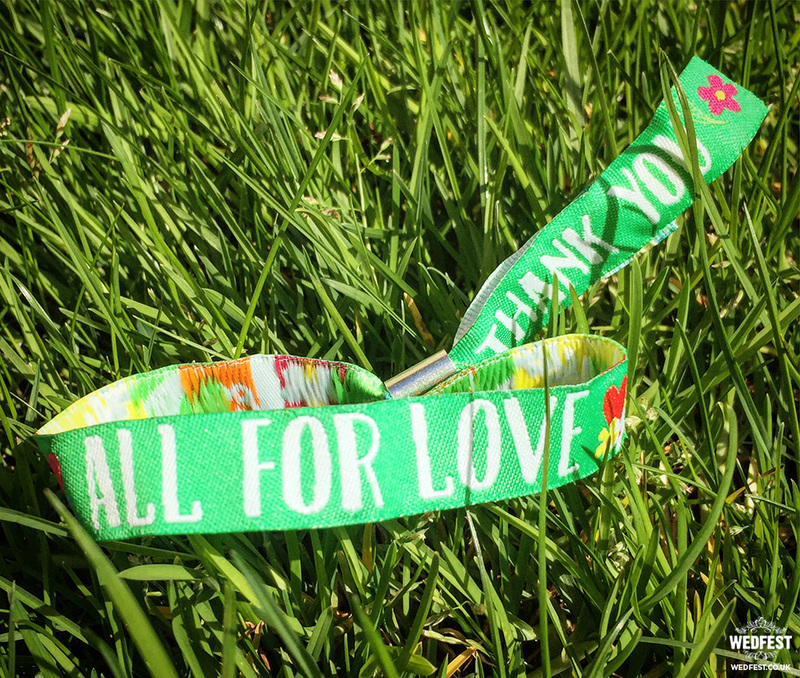 Love your EDM / Dance Music? 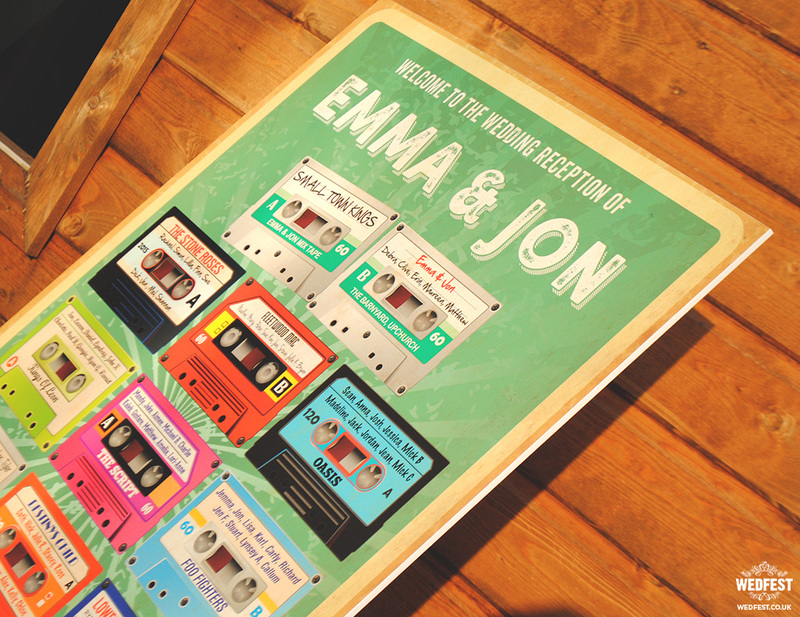 Want something more retro? 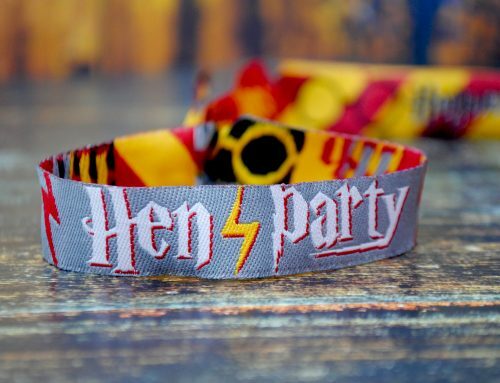 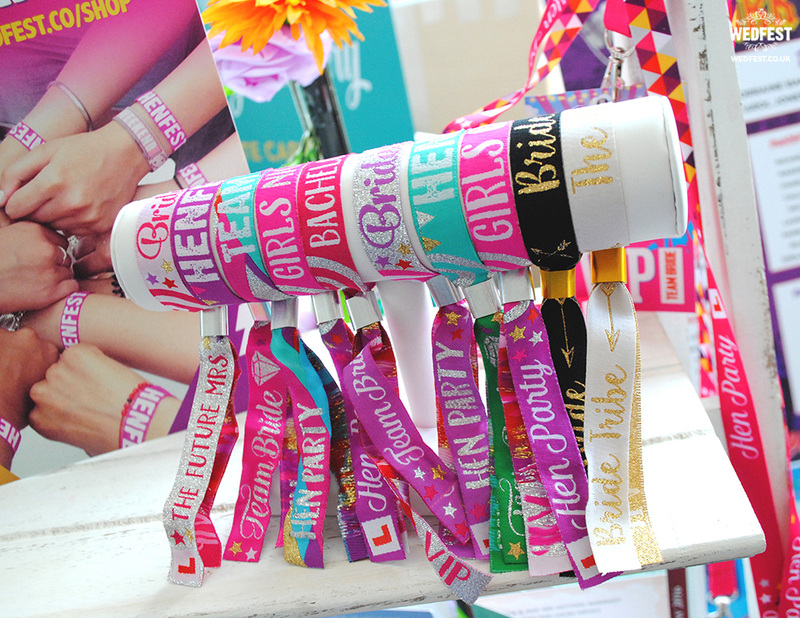 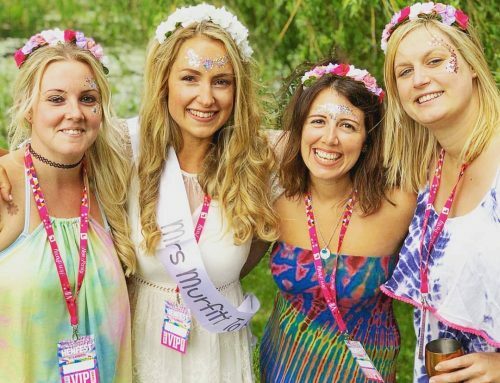 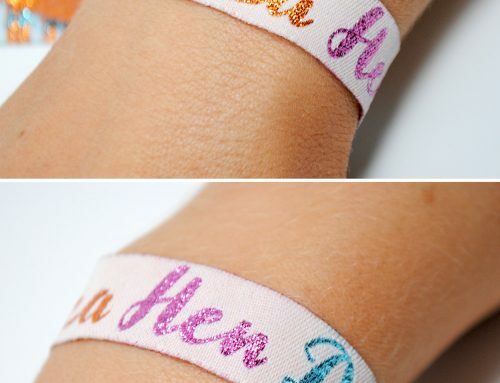 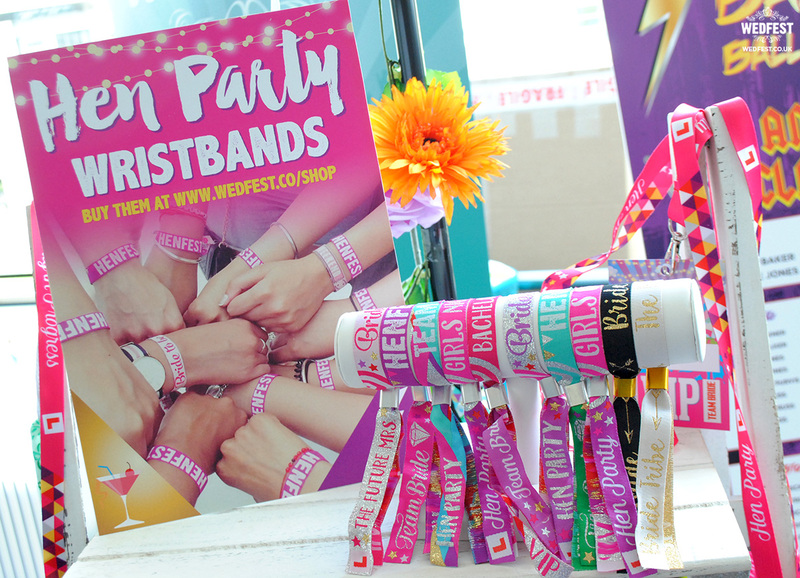 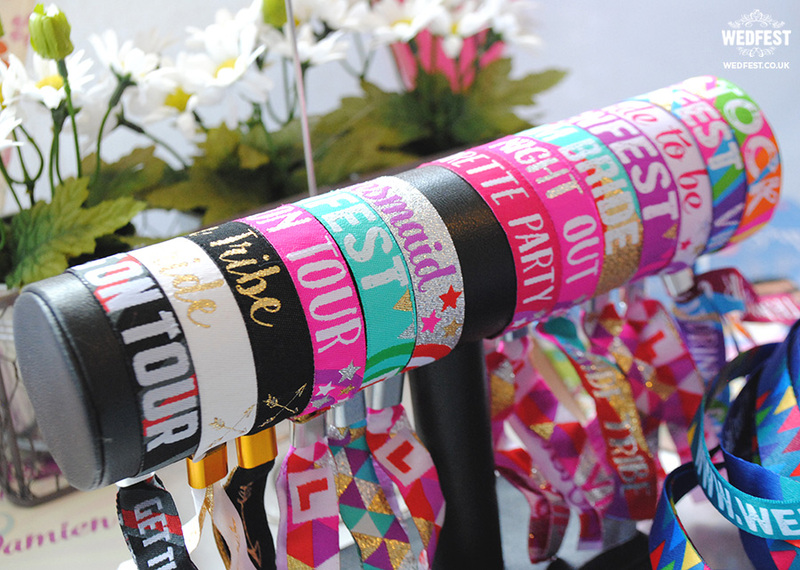 We have these great options..
Of course before all of the above happens you need to have a party right, so you may need some awesome and alternative hen party accessories for your hen party? 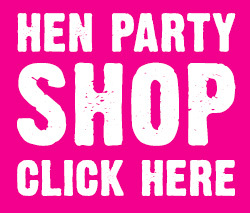 we got you covered… Lads we also got you covered too. 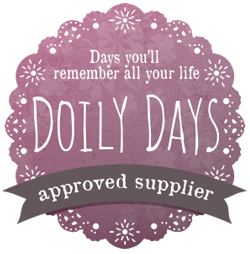 So there you have a small insight to some of our products, we say some and small as these don’t even scratch the surface of what we have on offer. 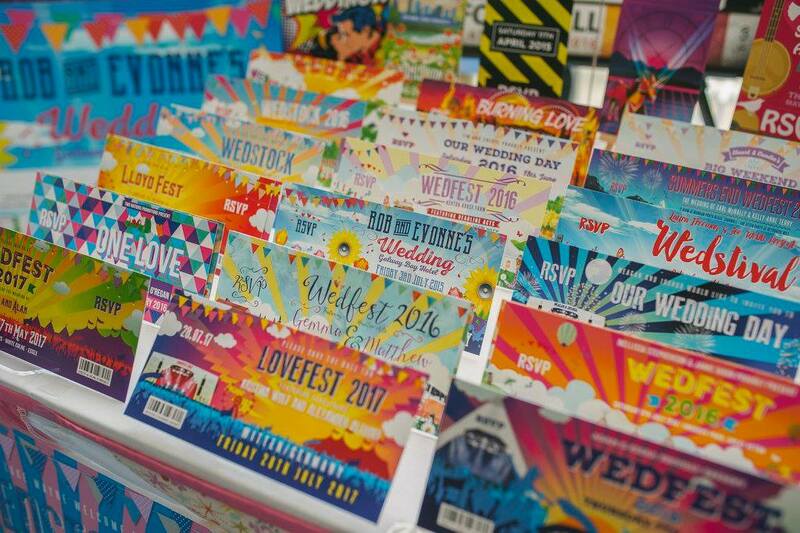 If you like what you have seen here and would like more information on any of our wedding stationery products please click here to get in touch.